In theory, any woman 17 or older can buy the Plan B emergency contraceptive over the counter. Younger teens can’t, and the Obama administration’s recent decision on Plan B keeps it that way despite the unanimous recommendation of an FDA panel. It gets worse. 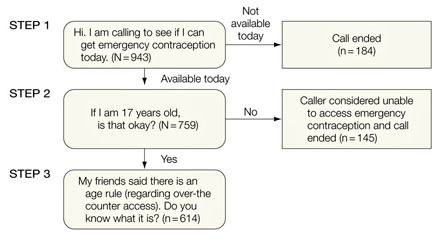 If they did have the drug available, which occurred 759 times, once callers revealed they were 17 years old, almost 20% were told that they couldn’t have emergency contraception. Legally, of course, they could have. But they were “misinformed.” Further analysis looking at the relative income of people living near the pharmacy found that people who lived in poorer neighborhoods were more than 60% more likely to be incorrectly told they couldn’t have the drug because they were too young than people who lived in more affluent neighborhoods. So let’s recap. Plan B is either unavailable or “hidden” in 20% of pharmacies. When it is available, people at the pharmacy are misinforming 17 year olds that they can’t have it anyway 20% of the time. They seem more likely to do so in poor neighborhoods, where a disproportionate number of teen pregnancies occur. All of this would be improved if the drug were just known to be available over-the-counter for everyone. This is just pesky “evidence,” of course. I imagine there’s no need to give it any kind of serious consideration.